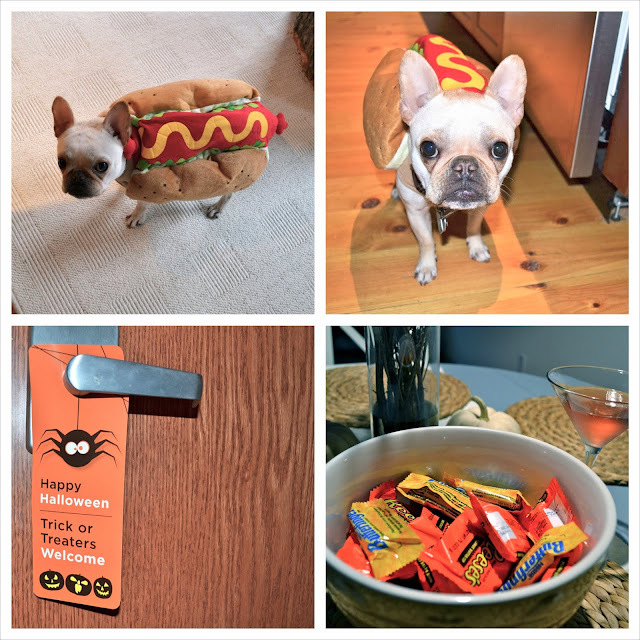 heather & olive: happy halloween(ie). Someone was not too pleased about her weenie costume (recycled from last year), but I certainly wasn't dressing up. She stepped up to the plate, albeit begrudgingly. My building offered door hangers to let the kids of the complex know that the inhabitants were participating in trick or treating festivities. I stocked up on my faves for leftover purposes (and I had a pomegranate tooni because that's how I roll). It was super cute, and I'm glad I participated. Olive then spent a chunk of the evening waiting for people to come to the door, and I stuffed my face with leftover Butterfingers watching the SAW marathon on IFC. Hot diggity dog. Sounds like the perfect evening. I had crazy Bmore kids (and adults) knocking on my door. I bet your trick or treaters were a lot cuter!